Please register as early as you can. I can use all the time you can give me to juggle passengers, boats and brunch reservations. 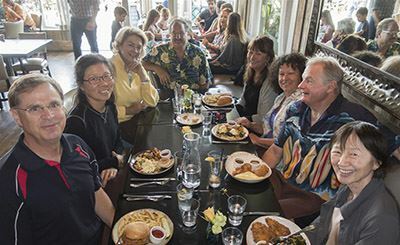 Cruise to a delicious brunch at Terrapin Crossroads on your or a volunteer skipper's boat. View stately waterfront homes as you cruise San Rafael Creek. If people want to stick around at anchor for the sold-out Dylan and the Dead concert at 4 pm, a boat will stay. Skippers are encouraged to sign up and volunteer to take passengers. Power boats should leave the Cay by noon to arrive at the Terrapin docks in time for our 1:15 pm reservation. Brunch reservations are limited. As of Thursday noon there are 4 seats left. If more people sign up I will do my best to expand the reservation. Priority will go to those coming on their or someone else's boat. Note: The playground next door is unavailable due to the concert. Anyone interested in scheduling a family-friendly day cruise to Terrapin (or elsewhere such as Angel Island) are invited to contact Walt or any Board member for assistance in setting it up.